13 anglers starting a week full of fun! Thom C. shows off his new stylish XTRATUF boots! Jeff K. gets a big yellow! Thom C. has a relaxing time on deck! Ron W. caught a nice one Tuesday morning! Ken Y. scores on YFT during Tuesday afternoon stop! Mike landed this beauty of a yellowfin on Wednesday afternoon! 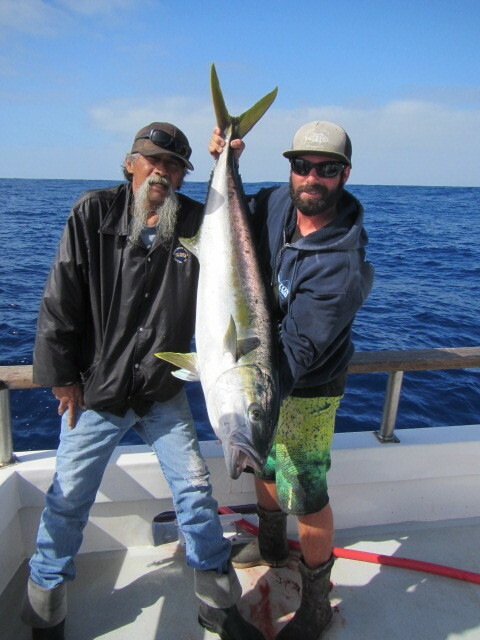 Thom C. lands a yellowtail on Thursday morning! Ken Hoffman caught a very nice dorado on Friday the 13th! Ken Hoffman with his yellowtail. Trio of dorados! Tommy T, Ken H. and Ron W.